So where is this area exactly? Chaudière Appalaches Quebec is located south of the St. Lawrence and the City of Québec. It extends south to the American border. That’s why I call the region Quebec’s southern jewel. 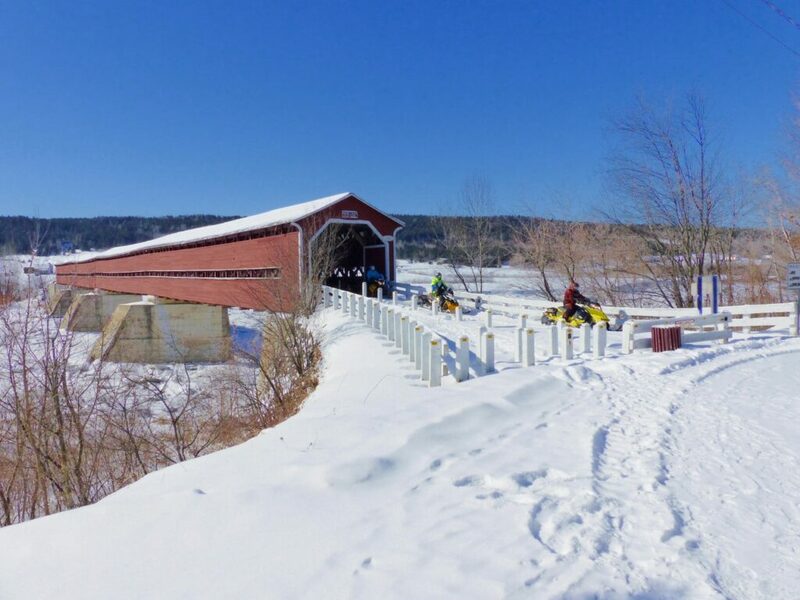 South, eh – so are there any snowy trails? Chaudière Appalaches Quebec actually benefits from being at a more northerly latitude than Montreal. It’s about the same positioning relative to Toronto as is New Liskeard, albeit farther east (about the same trailer distance from Toronto as it is to Cochrane). What’s more, much of Chaudière Appalaches Quebec also benefits from higher altitude provided by the Appalachian Mountain range. These mountains runs through its heartland in a northeasterly direction. It’s this combination of latitude and altitude that make most of Chaudière Appalaches Quebec an active snowbelt. As a result, it delivers over 4,000 kilometres of, yes, very snowy trails. This reality is why I’ve snowmobiled Chaudière Appalaches Quebec on several occasions on previous saddlebag tours. But this tour took a different tack. I wanted to stay at one central, snowmobile-friendly lodging that would enable us to stage multiple day rides in every direction. So I picked up a Chaudière Appalaches Quebec trail map and plunked my index finger down in the middle. Low and behold, I was pointing at the Town of Sainte-Marie. It’s located on the Chaudière River. This waterway bisects the area north to south. Sainte-Marie is also about half way between the City of Quebec and the U.S. border. That’s where we found the Motel Invitation Inn (see Where We Stayed). It is perfectly positioned for our purpose on Trans Quebec (TQ) Trail 35. We also ate very tasty breakfasts and dinners at La Barbaque Restaurant next door. 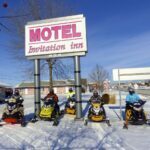 From the Motel Invitation Inn, we snowmobiled three different, 250 (or so) kilometre day rides. If time had permitted, we could have ridden a fourth day without much trail repetition. Best of all, each of these rides could be either longer or shorter. Your choice, depending on how much sledding your group wants to do on any given day. Generally, the terrain west of the Chaudière River is hill country. Here, trails wind through forests and rolling farmland. East of the river, the Appalachian Range becomes more pronounced. So Regional Trails (RT) 547 and 549 on either side of the Parc regional du Massif du Sud (South Massif Park) run through mountainous landscape replete with snow ghost trees. The altitude peaks at 915 metres at the Massif du Sud ski hill. It’s the highest in Quebec, where two nearby panoramic lookouts at Mount-du-Midi (off RT547) and Mount Saint-Magloire (off RT549) offer stunning views. This elevation generates about 600 centimetres per season of snow. The surrounding area also benefits from that bounty of white stuff. On one of my previous tours, the fresh snow was so deep on RT547 that we couldn’t climb one of its long hills and had to turn back! 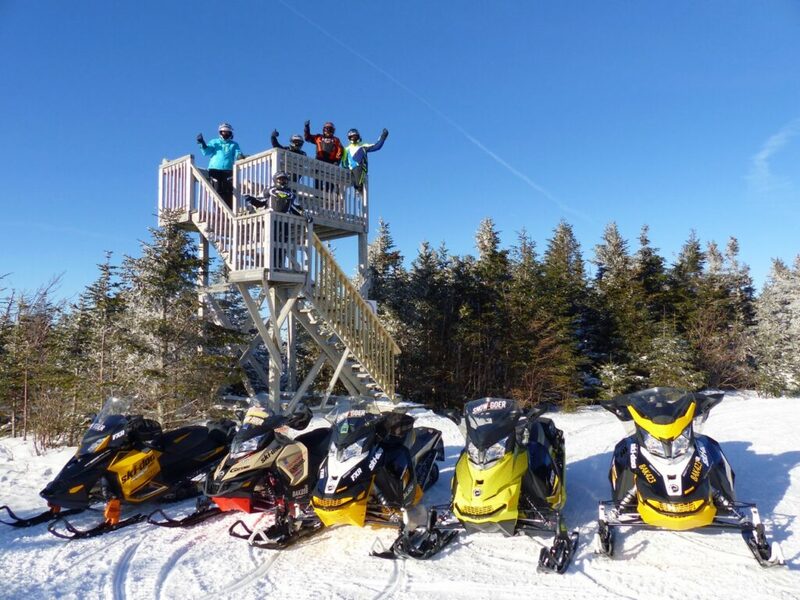 The Chaudière Appalaches Quebec region boasts other trail accessible, sightseeing attractions. 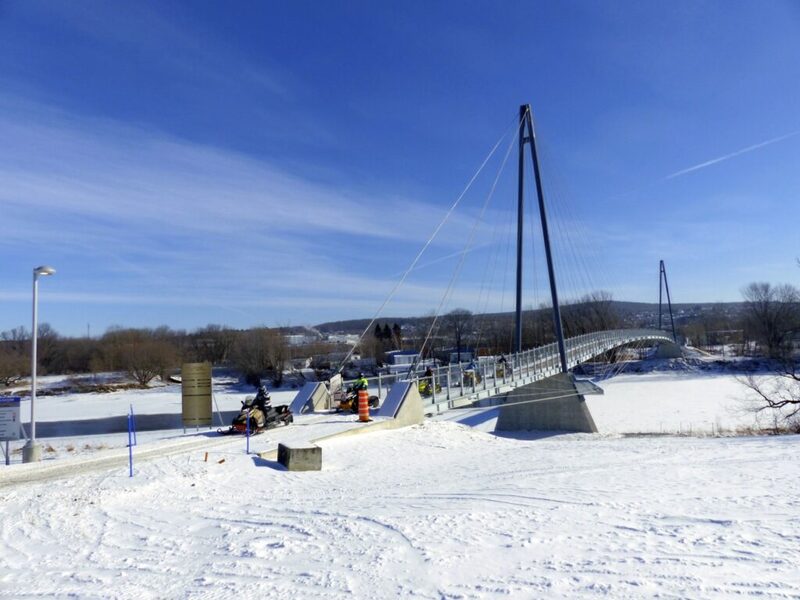 At Sainte-Marie itself, we crossed North America’s longest, cable-stayed, recreation bridge across the Chaudière River. Not far south at Notre-Dame-des-Pins, the longest covered bridge in Quebec also spans the Chaudière. And if you want to see wildlife, visit the deeryards located in the southern most area. They are near Saint-Georges (TQ75 between Notre-Dame-des-Pins and Saint-Georges), Saint-Gédéon (RT580) or Armstrong/Saint-Théophile (around junction of TQ75 and TQ25). But of course, the main attraction is those snowy trails. In true La Belle Province fashion, I’ve also found Chaudière Appalaches Quebec delivers consistently good trail quality, variety and access to services. Plus it offers a fair share of wow-factor routes that make you wish that day’s ride would never end. 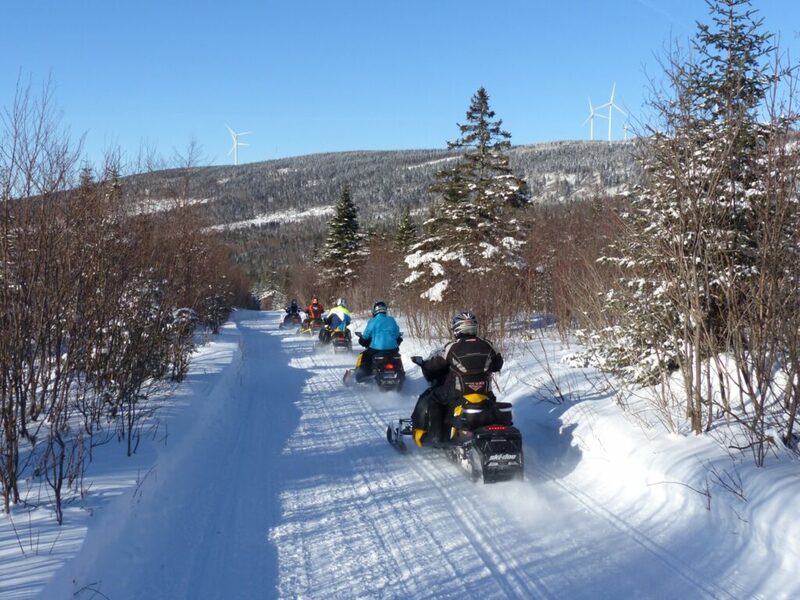 Bonus tip: Experience rural Quebec by trying some of the many club trails. They connect and link its main Trans Quebec and Regional Trails through the hinterlands. They also travel some scenic countryside, are well groomed and visit many quaint villages you won’t see otherwise. So why not choose to stage from one location for multiple day rides as we did? 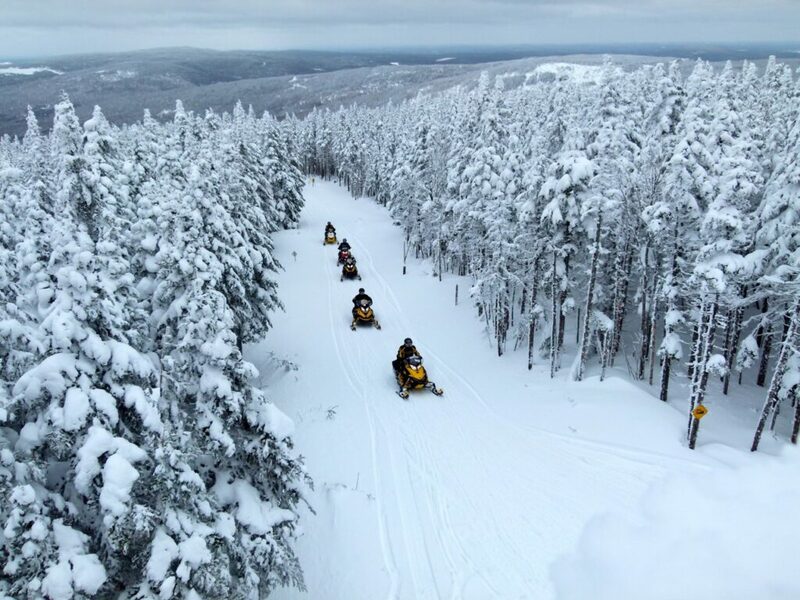 You won’t be disappointed in Chaudière Appalaches Quebec for your snowmobiling getaway. Motel Invitation Inn, Sainte-Marie – 418 387-7800. 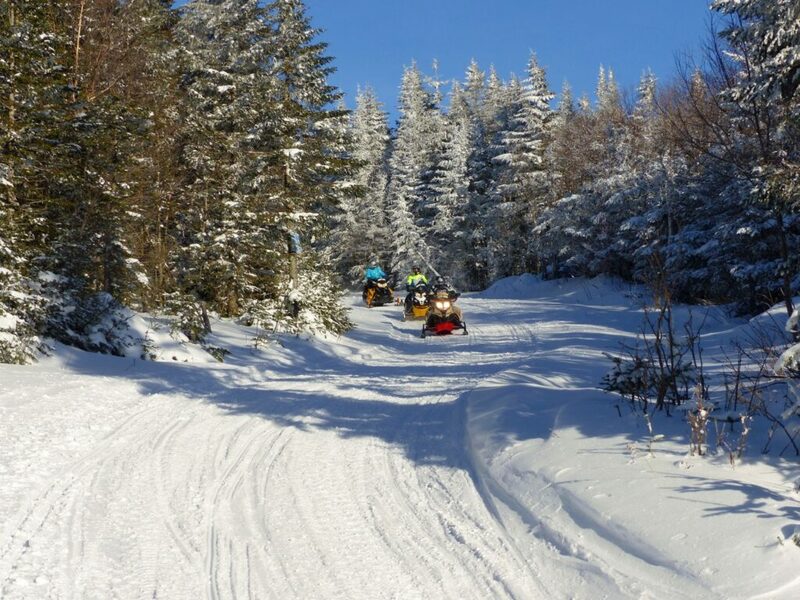 Located in town but with direct trail access to Trans Quebec 35, this clean and comfortable roadside motel offers a good snowmobile package with free Wi-Fi, fridge and microwave. There’s parking for trucks and trailers with sleds in front of your room. A gas station and Canadian Tire is directly across the road and LaBarbaque Restaurant is next door for early breakfasts and late dinners. Day One – Ride south 243 km via TQ35 > RT540 > RT535 > TQ75 > RT545 > TQ55 > TQ75 > TQ35. Day Two – Ride north 294 km via TQ35 > RT537 > TQ5/75 > TQ5 > (132 km to Montmagny for lunch & fuel) > TQ5 > RT551 > TQ35 > RT549 > TQ55 > RT545 > TQ35. Day Three – Ride east 254 km via TQ35 > RT545 > TQ5 > RT547 > RT551 > TQ35. Check out my tour articles in Supertrax!